Posted June 27, 2014 by Nicole Presley. For those of you who know me, anything near the ocean is my favorite place to be. When I am there, I sit and realize how small I am. There’s a peace about the water that consumes me. The ocean waves crash and nothing else makes noise, and in an odd way, each crashing wave has shaped me. Over the past ten years, our family has come to love San Luis Obispo. Some of my favorite restaurants, coffee shops, and people live in this beautiful little city. In one of my explorations of this town, I ended up eleven miles south of San Luis Obispo, in a tiny little beach town. I drove for a few more miles and found myself at this beachfront spot unlike anything I had ever seen: there were two benches sitting maybe thirty feet from the water in a quiet neighborhood. I sat down with my Bible and spent time with Jesus, and what seemed to be just a few short minutes turned into a couple of hours of reading and praying. I knew I had found my spot. Awakening Church has been journeying through the book of Mark. 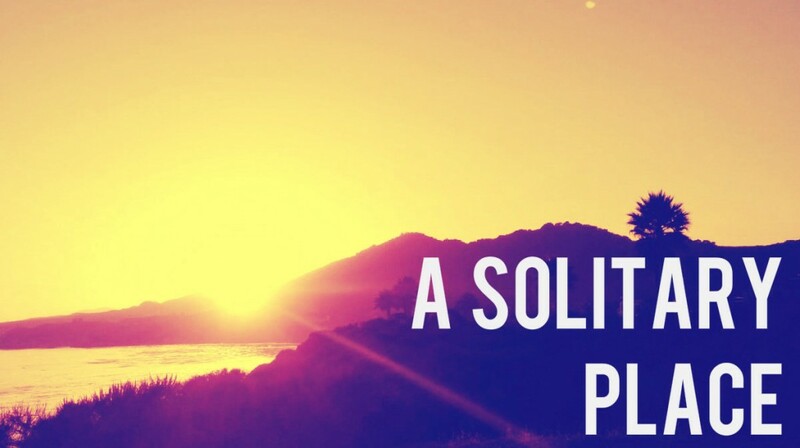 A few weeks ago, we heard about Jesus in the solitary place: “Very early in the morning, while it was still dark, Jesus got up, left the house and went off to a solitary place” (Mark 1:35). So often, I think of Jesus always being perfectly rested, never hungry, and being socially balanced. That sounds like a dream, right? I forget Jesus was fully human. He needed time away from others to spend with God, just like we do. He knew that if he wanted time away, he had to leave during the wee hours of the morning. I’m not a morning person, and I know I’m not that disciplined to wake up while the birds are still sleeping. But in all this, I’ve learned that the solitary place is so important. It provides an escape to sit and be with our Jesus that probably wouldn’t happen with the hustle and bustle of daily life. Let’s go back to this bench, my spot. Every time I am in San Luis Obispo, I make a stop at my favorite coffee shop, and drive to this spot every day that I’m in town. It’s become tradition. This spot is one of the only secrets I keep, because it is sacred to me. I know I will never run into anyone I know and I can expect to be completely uninterrupted. I meet with Jesus in deep and meaningful ways and he continues to show up and work in my life differently than the last time I sat on that bench. I cherish these moments because they are spent drawing closer to the heart of God. You may be wondering, why is Nicole talking about this bench? It’s just a piece of wood and some metal. True, well stated. But, this bench is one of the best places I’ve ever stumbled upon. It’s one of my favorite traditions. I want to encourage you to find your spot. Now, I don’t recommend it being three hours from home because gas isn’t cheap and driving the 101 every week isn’t as much fun as it sounds. Find a spot that refreshes you. Whether it’s on the beach, on a trail, in a field—find it. But here’s the catch; it has to be quiet. It will take time. I’m still trying to find a spot locally. There’s so much noise around us that we may not get fully rested or time to truly be alone with Jesus. I can guarantee you, friends, this will deeply impact and shape the relationship you have with Jesus. Spend some time exploring in the next few weeks. You never know where God may want to meet with you.